"Move 'em on, Head 'em out...!" With the pen set up in the new hay barn it was time to start moving the animals out one by one. Pappa was directing operations with the rest of us giving our support and his method was so good, it really worked well. Pappa drove the big tractor right into the passageway of the old hay barn and up to the door where the animals were. and secured it to the front end loader of the waiting tractor. While Pappa backed the tractor up slowly, Gustav coaxed the bull out into the passageway. Maxie and I watched from behind a barrier, at a safe distance. At first it looked like the bull was going to cooperate, but you never know what a bull might do, so we felt it was a wise choice. It was only a second until all the kicking and yanking and snorting began in earnest. See the dust cloud forming by the front feet? There was a lot of pretty fierce stomping going on. And it got worse before it got better. Back and back and back Pappa went, keeping it slow and steady with the rope taut. 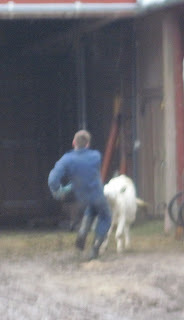 The bull ran this way and that way, lunging and charging as hard as he was able. and Maxie was on hand with the pitchfork to make sure the hay bale was loosened up so the bull could eat easily. This was nowhere near how it had been in the past. It was smooth and safe and the big bull was in more quickly than we could have anticipated. Using the tractor was an excellent idea. So now, with the largest animal moved, it was time to do the others. The young bull, not as big and strong but still with a mind of his own, danced around a bit, got tangled up in the tow rope, but eventually went in as well. while the last one got the "Miss Congeniality" award, walking happily along and right into the pen without a hitch to be with the rest of the gang. It went slick as a whistle and in record time. With the winter sun still shining through the trees, Pappa and I felt that the boys deserved to have something really fun after such an adventure. They had worked hard and done well. Both of them asked if they could go out into the forest on the snowmobile to build a campfire and have a cookout together. We thought that was a fitting reward. and loaded into the backpack with the other food. There are so many things to be learned in farm life. a better method, a clearer insight of what to try or how to do something differently. Our success in getting the bulls and heifers out so well this Spring was due in large part to Hans' dedication to providing the very best treatment of all living things. He had the idea, he led the way, we offered our support, and all were blessed. They're moved and they're out! 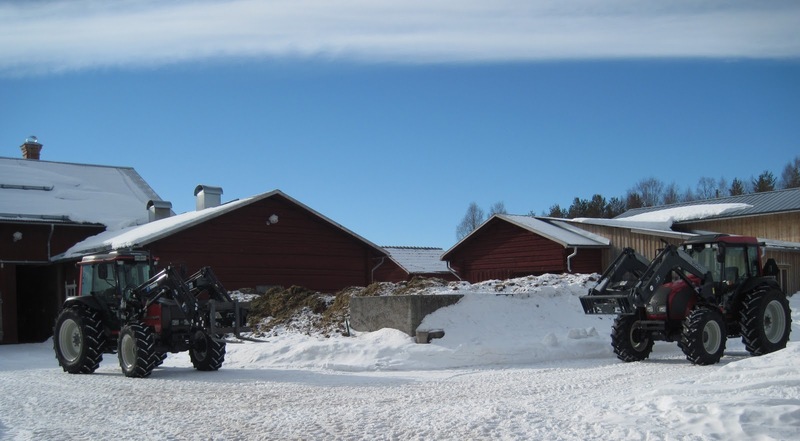 The farm vehicles that were put "under roof" so carefully last Autumn must be rearranged. We have to make an outdoor pen for the animals that were housed for the winter in the ungdjursstall (young animals' barn). when some of the young animal stalls are needed as "maternity wards" for the pregnant mothers approaching delivery. Last year with Manny on his mission and Pappa away, Gustav and I were on our own and had to borrow the metal gates to make the pen. hauled them home, unloaded them and set them up. It also goes without saying that he was the 'lucky winner' who got to struggle each one of the young heifers and bulls out until they were all safely corraled in their temporary apartment. No wonder the picture was blurry! Maxie and Pappa to help. First on the list was getting out the tractors and some of the other smaller implements. Then the big combine had to be moved from one side to the other to make the end-of-season woodbags more accessible. Pappa did the driving on that one. and finally pushed the last few meters in using the forklift and a log. Just so you know how efficient these men of ours were that day..
and the "Bovine Biltmore" was totally set up already. The gates were connected, the feeder was erected and the bale was inserted. "Birds Singing in the Barn"
This view of the barn entry doors shows the snow that has broken up and slid off the roof as we are beginning to have a day or two that is above zero. We know that there is still a while until Spring is actually here, but there is a feeling in the air that it's on it's way. And for now, that will have to do. 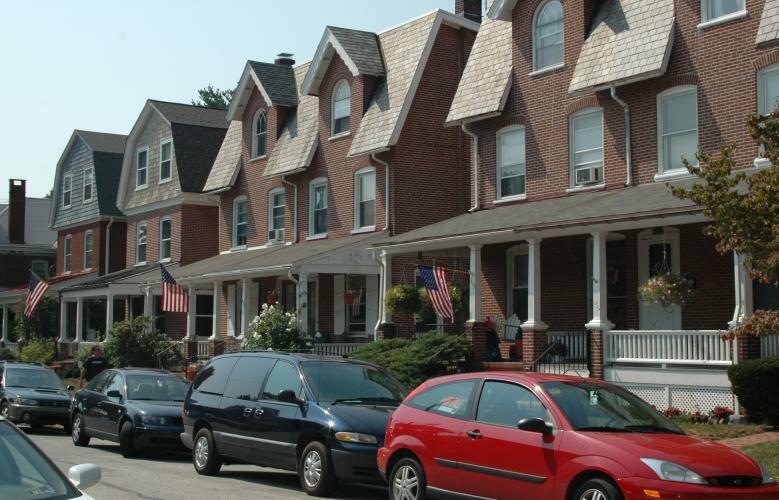 Surprisingly, sometimes I catch a whiff as I come out the door of the storstuga (main house) that smells exactly like West Chester, the beautiful town on the East Coast of the U.S. where I lived on Dean Street until I was twelve years old. 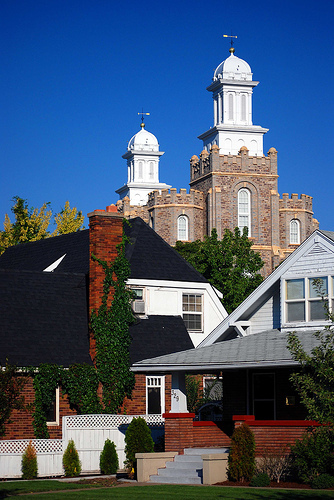 Logan, Utah, where I raised my children, is poles apart climactically from our dairy farm in the village of Eden, but there have also been times when I have walked across the snow towards the vävstuga (weaving house) and felt the same hint of warmth in the wind that I felt in the air in the Intermountain West at this time of year. 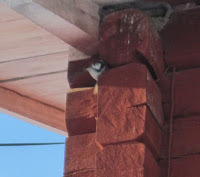 but I can never remember anything that has affected me as much as the arrival of the birds on the farm this Spring. Maybe it's because we have had a challenging winter with the broken bones. Or maybe it's because we have worked so hard to get some of the projects done that there has not been much of a lull. I'm not sure. The hay barn that was packed to the brim is starting to go down fast and at this time of year there is a big change in the natural light in there...it streams through the slats and floods over the remaining fodder. But the greatest change is in the sound. Where there is normally silence in the dimness during the winter, all of a sudden you hear just the faintest little flapping noises high up in the rafters. This year it happened on March 12th for the first time, a little over a week ago and almost a month later than usual. but the only member of the farm family I could find up there was this rascal. and look closely... even a drip from the downspout into a small pool of water in the snow. To add to this great feeling, when I walked by the Advent tree in the yard, all the lights that are still on it were twinkling.. the reflections of the newly directed rays of the sun. And finally, there was a patch of grass on the driveway by the vävstuga. A significant spirit-lifter on this beautiful farm that I love. This morning, nine days later, I decided to try one more time before I send this post off into cyberspace. 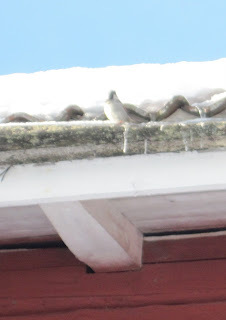 Gustav had come in from the barn to tell me there was a small group of rådjur (raw-yure) out in the field. These animals, which I have never seen in the four years I have been here, are somewhere between an antelope and a deer and proportionately small even at full-growth. They were beautiful so I snuck up as close as I could to get a better picture before they ran away. 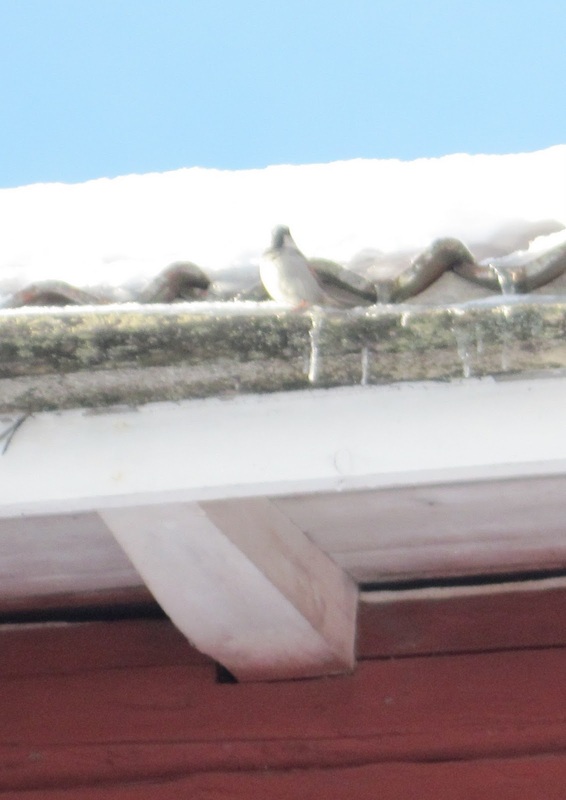 Coming back toward the house, I heard some chirping and spotted this little Fluff-o on the left under the eaves of the main house by the porch door, and one of his relatives on the edge of the roof at the right, tweeting away as he sat in the snow. 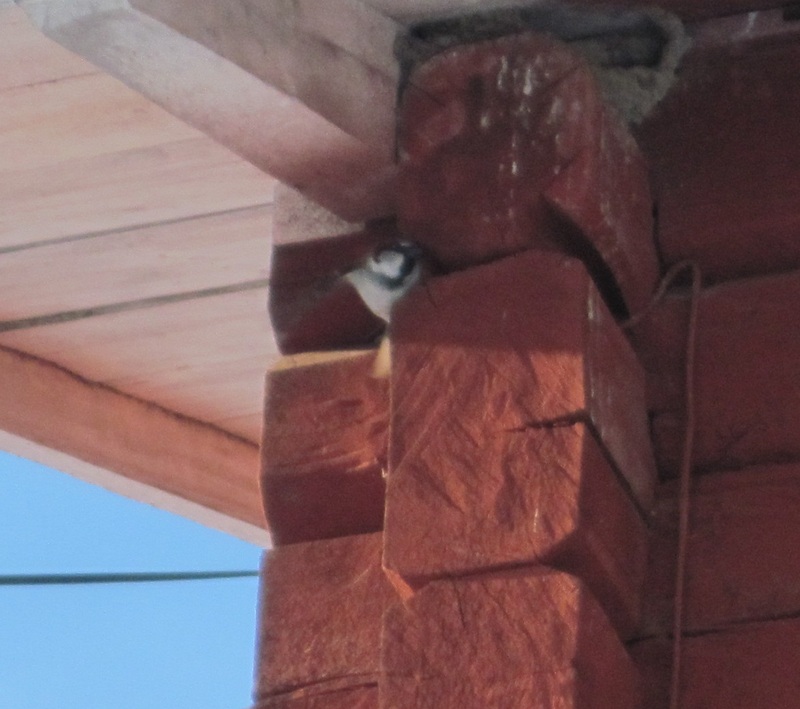 My luck was still holding as I approached the barn doors and this Puff-ball was warbling it up from his perch above the window. That gave me even more hope so I hurried through the ladugårdsporten (law-gords-por-tunn) and made my way past the resting cows and into the hay barn. Yes, the picture is blurry and it's dark. sitting on top of a board almost dead center in the middle of this picture. and he was singing his heart out! There are birds singing in the barn!